Want to save the planet? Become a part-time vegetarian. Want to save the planet? 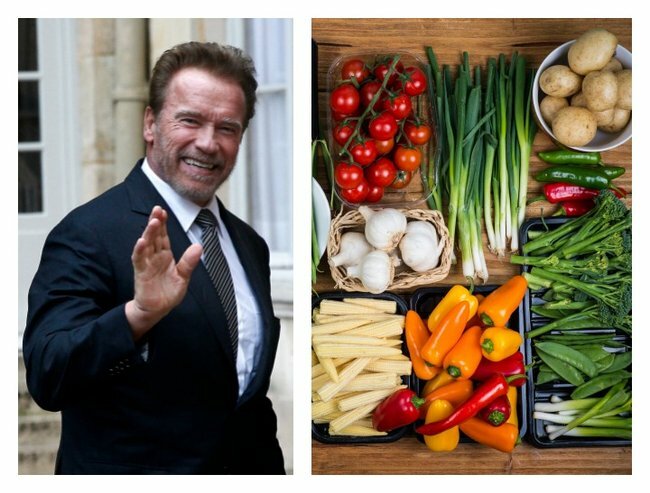 Become a part-time vegetarian, says Arnie. It’s unrealistic to expect everyone to adhere to a strict vegetarian diet, but as even Arnold Schwarzenegger has found, a “part-time” meat-free diet could go a long way to addressing environmental problems, writes Tara Watson. What many environmentalists have been saying for decades might finally be starting to sink in – after the Terminator said it. My friend recommends stop eating meat. I think that’s a good idea but people won’t buy in. People will buy in to stop eating meat one or two days a week – you have to start slowly. It’s a very big challenge but it doesn’t mean it shouldn’t be done. It is idealistic to imagine a world where more than small minorities of people are vegetarians, rather than meat-eaters, and finding a method to tackle the over-production and over-consumption of meat is no easy task. Becoming either a part-time, 2-3 day per week, or a weekday vegetarian might be the answer. The world has doubled its per capita meat consumption since 1961, and it is expected to double again by 2050. Australia is the world’s biggest meat eater, consuming 90.21kg of meat per person in 2014, surpassing barbeque nation the United States, which eats 170 grams less per person than Australia, according to the latest figures from the OECD and UN Food and Agriculture Organisation. Watch Arnie talk about climate change below. Post continues after video. Reducing meat intake is a crucial step to lessen the effects of climate change. The global livestock industry produces more greenhouse gas emissions than all cars, planes, trains and ships combined, with one-fifth of global greenhouse gas emissions attributed to livestock alone. By comparison to staples like potatoes, wheat and rice, beef requires 160 times more land and produces 11 times more greenhouse gases. A recent report from the Intergovernmental Panel on Climate Change found that a global dietary change can “substantially lower” greenhouse gas emissions. A weekday vegetarian diet would curb meat consumption by 70 per cent. I think encouraging the people themselves to have meat-free days or weeks is great. Also just to explore the other food options out there. There is a big wide world of food products and animal-free products out there. It really does add up and makes a big difference. Hopefully if they start with one day, then maybe two, then maybe three and it goes on from there. But people should find the right diet for them. But is being a part-time vegetarian a hypocritical move that contradicts many of the reasons people reject animal products altogether? Burgess says that she does not see this as the case. It’s certainly not hypercritical. It’s a really personal decision. For Voiceless, we are not prescriptive when it comes to people’s diets. This idea is taking flight. Locally, Meat Free Week was a big hit, promoting meatless week sponsorship. In the UK, Paul, Mary and Stella McCartney launched Meat Free Monday in 2009 and achieved relative success, with the program endorsed by several British celebrities and even the great-great-grandson of Charles Darwin. These public initiatives demonstrate that promoting vegetarianism with an all-or-nothing approach is often unrealistic and doomed to fail. Eating habits do not need to fall into black and white binary categories – omnivore or vegetarian. Nutritionist Tracie Hyam says that choosing to be a part-time vegetarian would encourage everyone to eat less meat without the pressure of going cold turkey. Part-time vegetarian rather than full-time is certainly a great option and more likely a habit and lifestyle that will be sustained. I recommend for the majority of clients to incorporate at least one or two days of meat-free food in their week. Doing this offers them a more varied diet – perhaps trying foods they would normally not eat – and often it provokes people to include more vegetables in place of where they’d primarily eat meat. The reasons to eat less meat are plentiful. Yet to permanently give up meals containing meat entails a significant shift in eating habits that can be a lifestyle hassle; affecting daily routine and social life. Many vegetarians have ended up switching back to meat after they found that their alternative diet was hard to accommodate day-to-day. A 2014 study by the Human Research Council found that 84 per cent of vegetarians and vegans return to eating meat, with 43 percent of ex-vegetarians finding the problem was with “purity” – not being able to maintain a strictly vegetarian diet. The key findings were that encouraging meat reduction is more effective in the long term than meat elimination. For lifelong meat eaters, it’s difficult to fathom the idea of eating your last burger or steak and it seems counterproductive to enforce such a disciplined eating regime. Eating more healthily, ethically and environmentally conscious does not have to mean forcing people to give up their favourite meals. It’s futile and unsustainable to encourage people to be straight vegetarians, if it won’t adapt to their lifestyle and tastes. Instead, be like the Terminator and make our own rules. Tara Watson is a freelance journalist and podcaster. She has previously written for The Vine, ArtsHub and Colosoul Magazine. You can follow her on Twitter @TarasWatson.